The core strategists of OPEC are brilliant. In a nutshell, they’ve done TWO incredibly smart things. One is that by timing their much publicized production cuts to start in January 2017—when oil demand starts a steep rise—they really don’t have to cut at all. 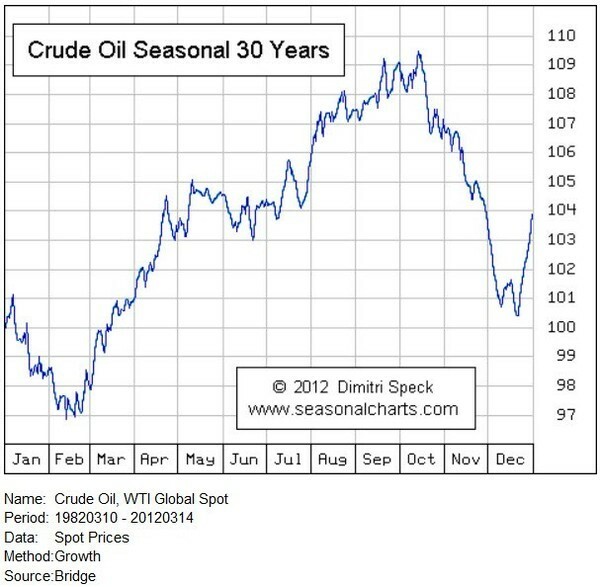 As you can see on the chart, oil demand rises very steadily from February to August—each and every year like clockwork. Add an increase of 1-1.2 million barrels a day into that seasonality, and voila, the 1.2 million barrel a day cut essentially disappears. Over the last five years, Saudi crude production in October averaged 9.827 million bopd. Over the same five years, January production averaged only 9.31 million bopd — a decline of 513,000 bopd, almost exactly inline with their 486,000 bopd production cut. Total OPEC production is similar averaging 32.03 million bopd in October over the past five years, then declining 1.24 million bopd to 30.79 in January. I told you OPEC is smarter than you think. But the really smart thing was…by intentionally announcing just a six month production cut, they flattened the forward curve for oil. That greatly reduces the incentive for US producers to hedge—ok, well, maybe it just reduces their price. If oil producers want to increase their debt levels to drill wells, they are required to do some level of hedging. The Saudis don’t have to do that. They can sell at spot or front month prices all day long. So when the front month oil contract is up 13%, but the total curve going out two years is only up 7%–the Saudis get ALL the benefit of the oil price rise. But the US shale producer who wants to ramp up production only gets 7%. Had OPEC agreed to just freeze production but do it indefinitely…it’s quite likely the back end of the futures curve—those out 12-24 months—would have risen a lot more. The reason for that is–oil demand is rising a steady 1+ million barrels a day per year. And even if natural annual declines in production are only 3%–that’s 2.79 million barrels day less production. That’s a swing of 3.79 million barrels a day—each year. That gets rid of 500 million barrels in a hurry. The Market would price in much higher oil prices very quickly in that scenario—which means the back end of the curve would rise—a lot. That is called contango. And the contango would be steep—meaning the guesstimated oil price 12-24 months out would be—a lot—higher. And US shale producers could hedge that out. 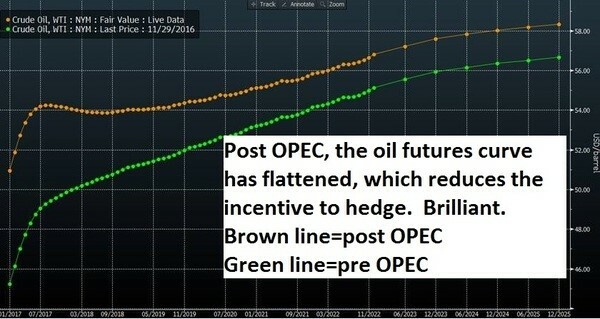 But with just a 6 month cut creating such a flat curve—because who knows if OPEC will get along well enough to keep the cuts in place—hedging gains are much more limited. This helps keep production growth down in the US. I think it’s a brilliant strategy. I bet they only announce 3 month extensions, and flatten the curve even more. Why wouldn’t they? The other side effect of this deal is…the Market will now view $44/barrel as OPEC’s line in the sand. There is an effective $44 OPEC put in the market now. As dysfunctional as OPEC may be (though I think they look pretty smart now), the Market believes OPEC will do something about oil prices if they get back down to the $44/b it was at when this deal was crafted. EDITORS NOTE--OPEC is smart, yes, but The West still won the oil war. And that victory is because some companies lowered their costs by an incredible amount in the last two years–but none as much as my #1 Oil Stock–whose financials show they find and develop oil for $2/barrel. TWO DOLLARS. Those are the companies I want in my portfolio–the name and symbol is right HERE. Next post: Can This Idea Save the Orphaned Wells? Previous post: Christmas Has Come Early for Canadian Oil Producers—FOUR times!